What a great idea. I’ve never broken it down this far, but when I look at my favorite BG maps, I kind of see this in my head, especially EoTS and AB. 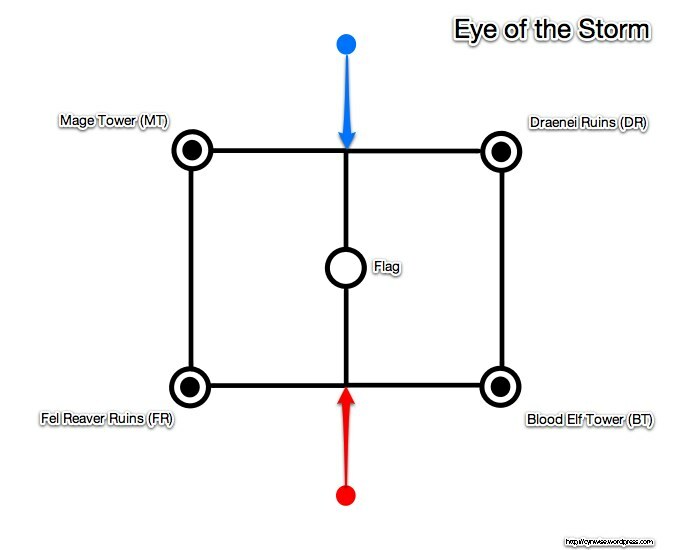 It’s why I don’t understand when people get confused about towers vs. flag. I see 5 nodes; I don’t always understand what they’re seeing. IoC is so new to me (having only started BGing again in the past couple of months) that I haven’t yet got a grasp on it. Being able to see it like that alongside the ones I’m already so in tune with is extremely helpful. 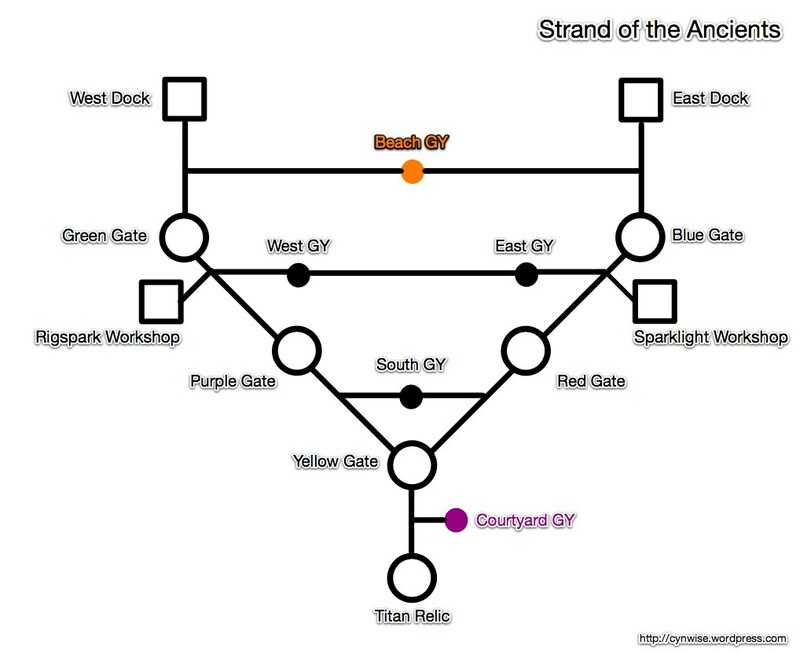 Making these maps really helped me understand the graveyard control strategies in Strand of the Ancients. I’ve played Strand a lot, but there are some subtleties about the South GY that I just wasn’t getting. IoC was the BG that inspired this post. Looking at the map, I was struck by how simple it was — but it sure didn’t feel that way learning it! It was big, and confusing, and WTF am I supposed to do? I see them in my head like this, too. There’s a lot that goes into visualizing a battleground – this is just one aspect. 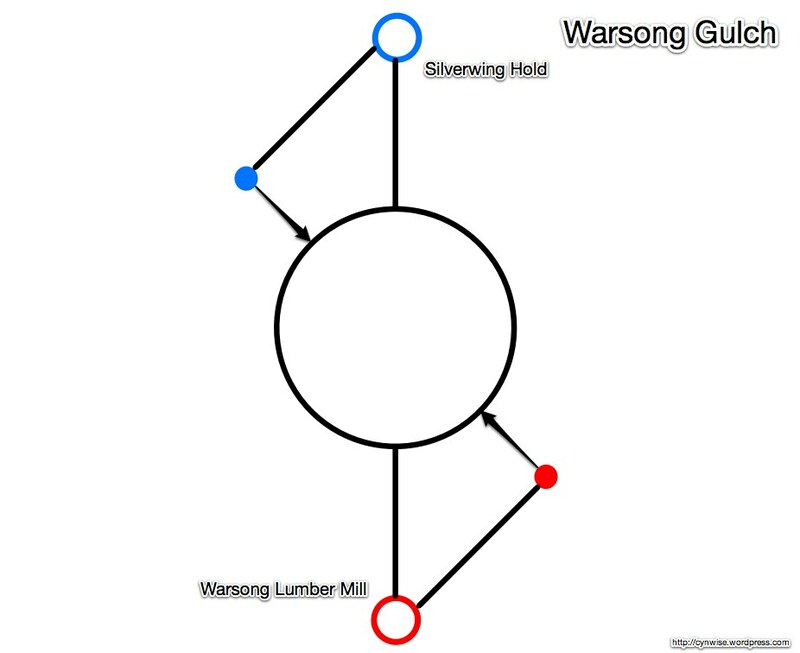 I think you warsong map is missing things. Each base has two distinct entrances from a ‘choke point’ perspective. Also the line from the GY out should be an arrow. Great idea though. I mentally convert all map this way and often forget that not everyone makes the mental overlays of time/path/importance. Great suggestion on the arrows. I think I had a reason why I made them lines, but whatever it was I’ve forgotten it. 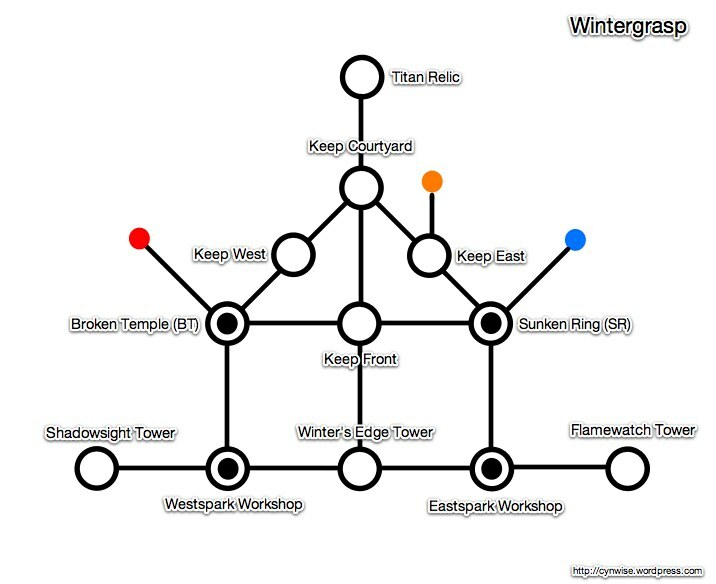 I updated the WSG map to reflect your suggestion. I’m going back and forth on having the double paths from midfield to the bases. 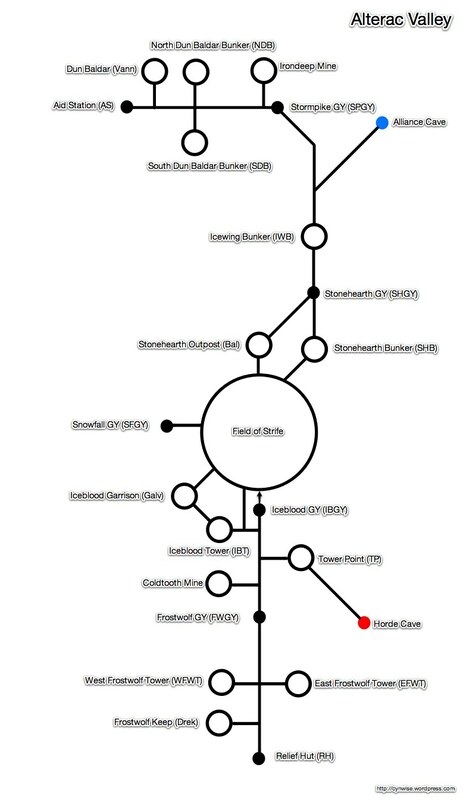 I have another version which presents all 4 routes (Ramp to balcony, ramp to FR, tunnel to FR, tunnel to roof) but it’s waaaaay to complicated. It’s also presenting routes dictated by the terrain that have the same goal. 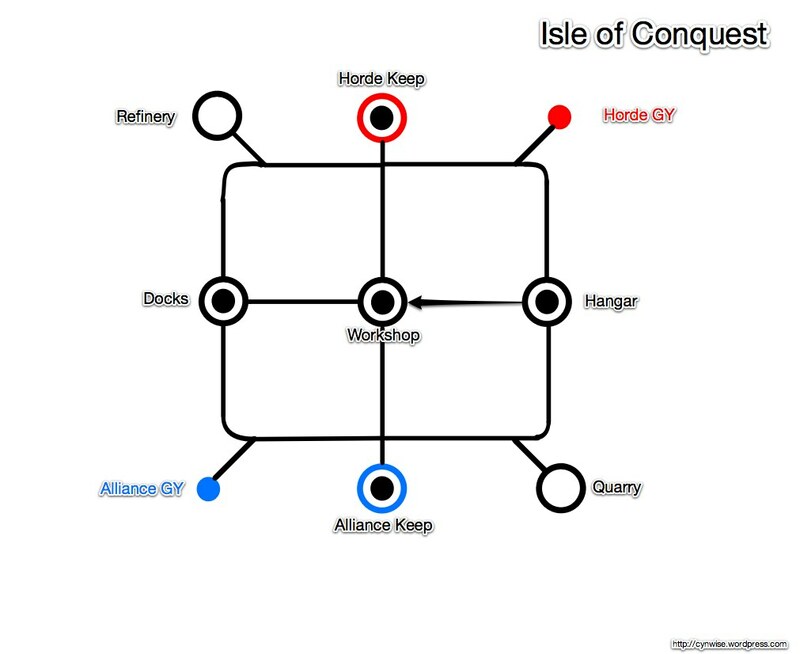 In other maps I omitted routes that didn’t add a path that skipped a node (the high road out of the Alliance cave in AV, the dry riverbed in IoC). It doesn’t look like it, but Warsong Gulch really is the hardest map to represent topologically. It’s *so* simple that you lose all the detail of the battleground. It really is a simple strategy that requires you to know the terrain, and not the objectives. I’m still thinking about it. Would love to hear more about what people think here. Ok, this I can get behind. This is MUCH easier to see. I still think it’ll take while of staring at AVs map to get it.. but these simplify it and eliminate a lot of the confusing and unneeded information. :p I look forward to the day when I see Nibuca on the same BG as myself. Win, as usual when you think outside the box. I think you may be missing an arrow-line in IOC from Hangar -> Workshop. It’s possible and reasonably easy to jump down the ledges on that cliff without any special slow-falling tricks. Thank you, sir. How’ve you been? You know, for the last week I’ve had that arrow in but haven’t logged in for a few days to check out if you could do it safely without slow fall. So I yanked it out today. I’ll put it back in. I’m listening to your TN podcast…ty for the almost-name-drop, I smiled :-). I thought, I should do that!…and then I thought…I can’t talk for two+ hours :-p.
Ihra was on my list of bloggers you should interview next, should that question have come up. You should totally get him on your show! Wonderful job on this. In Strand I guess I had this mental block that I was traveling north from the shore to the final relic. Perhaps because I was going uphill, I’m not sure. Finally after a few games I got my head wrapped around it. This is a wonderful view of the BGs and I think a great way to think strategically when playing. Thanks! 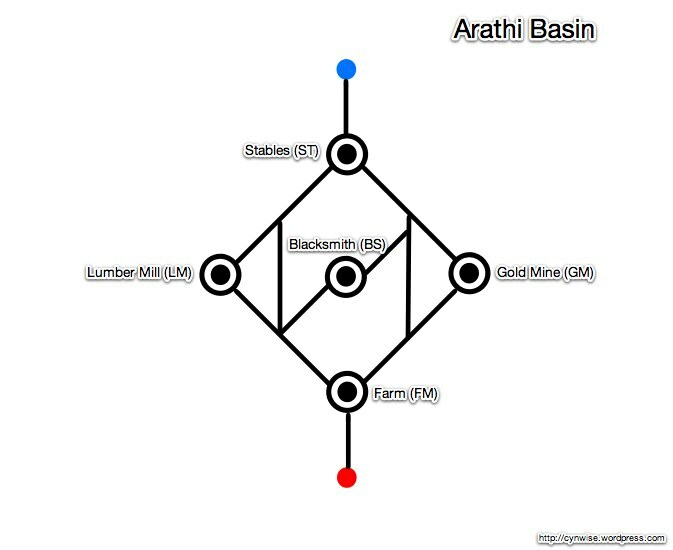 I still get confused about the cardinal directions in Arathi Basin — I don’t think of it as Northwest or Southeast, I think “STABLES” or “FARM.” It’s all relative to each other. Yeah, I understand. Great work though with them all. That is awesome. An excellent, excellent way to present the BGs, particularly for folks new to them. This is amazing. It makes the roads so much clearer to me (I’m a newbie!). It just eliminates me having to squint at the map trying to find where I am and then where I want to go and then how to get there, meanwhile getting stunlocked with my map up. But now, I can go, okay, I’m here, and I just have to go this way to get there, and…it feels easier to navigate on the fly with these maps than anything else. Though, I wish the abbreviations were bigger with the full name as the smaller parentheses. Since everybody uses the abbrevs it’d be faster to just spot the abbrev. I might just print these and write it bigger myself. Pingback: There goes the month’s budget « Armaggedon's coming! Thank you. This is great! Now my response time to help teammates will be quicker. Where is the Twin Peaks map though? You’re welcome! Glad you find them useful.